The Battle of Humbleton (or Homildon) Hill took place on 14th September 1402 on a site a couple of miles NW of Wooler. It pitched the Scots against the English, and was famously mentioned by William Shakespeare in his historical epic, Henry IV, Pt1. It resulted in a resounding victory for the English, but was not effectively followed up, suggesting that the loss of life was largely in vain. The Scots were getting particularly ambitious at the time due to Henry IV’s preoccupation with the troublesome Welsh further south. An initial set-to at Nesbit Moor in Berwickshire in June 1402 had seen the Scots defeated, but they continued snapping away at the English heels. In August the Earl of Douglas led a 10,000-strong army south, devastating Northumberland as far as Newcastle. Turning back north laden with plunder, they set up camp at Milfield north of Wooler. The English, though, weren’t prepared to let them get away, and the Earl of Northumberland, assisted by his son, Harry Hotspur, cut them off and forced them into battle. As the two armies circled one another, the Scots settled on the rising ground north of Humbleton Hill in the foot of the Cheviots. They moved into their ‘Schiltron’ formations – thus providing the deadly English archers with mightily easy targets. The victorious bowmen struck most probably from the high land around Harehope Hill, with most of the Scottish casualties finding their final resting places in the plain to the north and east as they sped for safety – and into the arms of the main body of their foe. Many thousands of Scots perished, with only a handful of English dead – and all in the space of an hour or so. The English, though, didn’t push ahead with a full-scale invasion of Scotland, preferring instead to concentrate on their Welsh problem. The Percy family – Harry Hotspur and his father amongst them – wasn’t best pleased with the tame aftermath and eventually turned against Henry IV. Both father and son ultimately lost their lives in failed rebellions against the English monarch in the ensuing years. 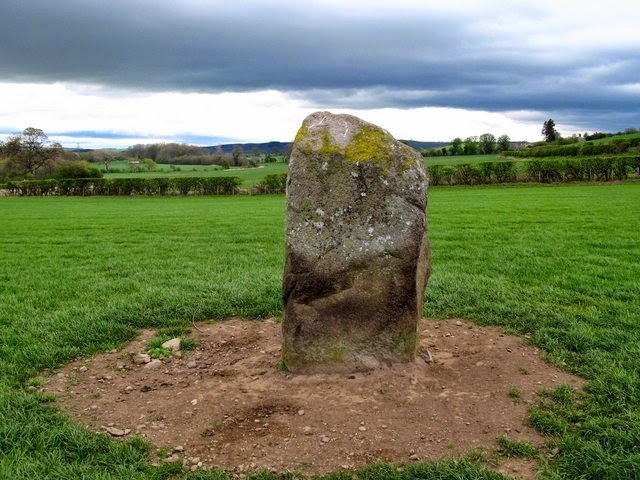 The Bendor ‘Battle Stone’ has traditionally marked the spot of the 1402 conflict – though it is most likely a Bronze Age standing stone, ancient cists having been found thereabouts.